Why should I have Micro-dermabrasion? Is Micro-dermabrasion for facial areas only? Micro-dermabrasion is a skin restoration procedure that aims to produce smoother, younger looking skin by dispersing organic crystals through a hand piece which also removes the crystals, the dead and damaged skin cells by way of a vacuum. 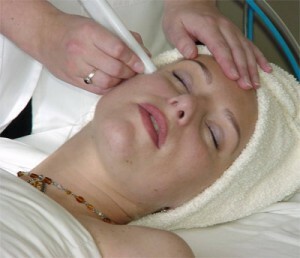 The depth of the Micro-dermabrasion is tailored to each client’s individual skin profile. The result is a gentle, abrasive polishing of the skin, leaving your skin softer, smoother, younger and brighter. The Micro-dermabrasion treatments take between 30 and 60 minutes and are performed at 2 week intervals. More than one treatment is usually required to achieve the client’s desired results. Micro-dermabrasion is used to treat minor acne scars, minor surgical scars, narrow stretch marks, fine lines, moderate wrinkles, crow’s feet, blackheads, enlarged pores, and pigmentation problems such as age spots, uneven skin tones, brown spots, and melanosis. It is ideally suited for aged skin and skin that has been damaged by overexposure to the sun. Micro-dermabrasion treatments improve the quality, texture and pigmentation of the skin. No. Micro-dermabrasion can improve many areas, including arms, legs, chest, between breasts, bikini line, backs of hands and the back. Micro-dermabrasion requires multiple sessions and maintenance treatments, an individualized skin care program is recommended to maximize results.